So undertake CPA-marketing: Cost Per Action (or Cost Per Acquisition?). 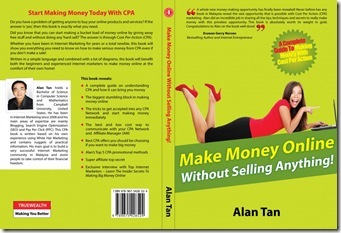 Alan Tan details how he makes money online without selling. Have you listen to my Radio Interview on our local radio station, BFM 89.9 – The Business Station on last Saturday-25/6/11 at 11:30am? I was talking so fast and nervous as this was my first Radio Interview. Thanks to BFM 89.9 for giving me an opportunity to introduce the public about CPA Marketing-How to Makes Money Online Without Selling Anything! You may listen it here via podcast. Ever since writing my book called “Make Money Online Without Selling Anything!” which was publisher by True Wealth, I do get a lot of enquires on personal coaching, seminar, workshop and etc. At this moment, I don’t offer any. If have any, I’ll update it in my mailing list. It’s very important to get a solid foundation on CPA Marketing as I’ll not cover it again as was all reveal in my book. Some people would learn more by watching videos training. One of the good CPA Marketing training is by Ritoban Chakrabarti called CPA Instruments. This training comes in 9 different modules with step by step video instruction step by step action step and detail pdf instruction, that cover all you need to know about CPA Marketing and HOW you can make Money Online Without Selling Anything using free method. This entry was posted on Monday, June 27th, 2011 at 12:03 pm	and is filed under Make Money. You can follow any responses to this entry through the RSS 2.0 feed. Both comments and pings are currently closed.